Conscious Branding is a step-by-step process that enables entrepreneurs to consciously build a differentiating brand using the Brand Map, a simple visual diagram of how brands function throughout an organization. The Brand Map helps managers and staff visualize their brand and demonstrates how they can make their brand real through everything they do. 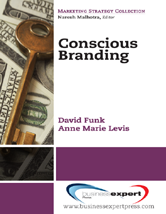 Conscious Branding describes a simple, easy to understand and tested in real life system.